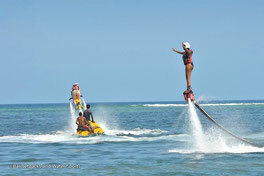 Water- and Fun sports in Lovina, North Bali ◦ Parasailing, Flying Fish, Jet Ski, Flyboards... ◦ Free hotel Shuttle in Lovina ◦ BOOK HERE! The beautifully located and well maintained area with included restaurant and relax spaces directly on the beach is a wonderful place for a some enjoyable hours. So you can treat yourself by having relaxing breaks between the thrills. Super friendly, English speaking staff instructs you and monitors your safety. The speed boat is increasing speed while the Fly Fish starts to jump on the waves ... before it starts flying. 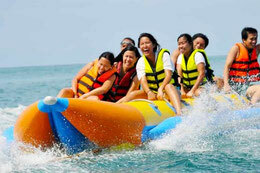 Fun activity to ride a banana or donut boat towed by a motor boat. Ready to laugh and splash? 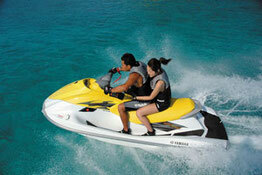 For all who love speed and strong HP on the water: Jet Ski's or water scooters for thrilling fun on the waves! 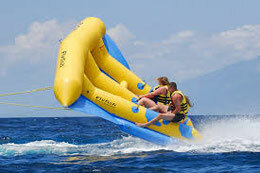 Also available: Butterfly Dolphin, Speed boats, Knee Boards and Wakeboarding! Na, ready for fun and action?